Emily turned five on Saturday. For weeks she has been so excited about her birthday and about her birthday party. She had a fabulous day with her sweet little friends and she feels so grown up now! 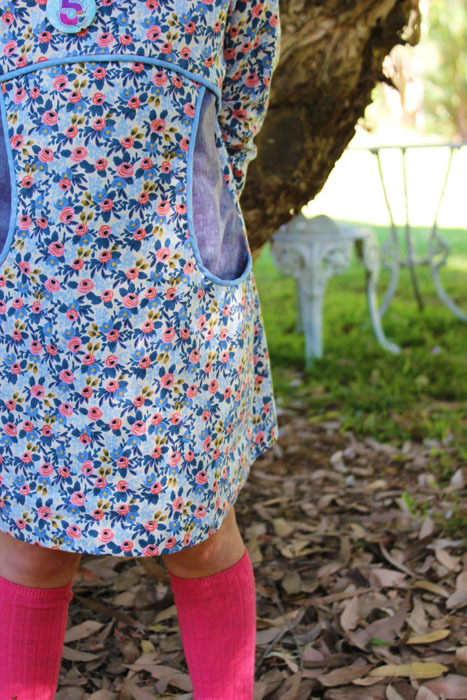 I made her this Miss Polly dress for her birthday from some beautiful fabric I purchased from a store I'd not heard of until a few weeks ago - Ministry of Fabric. Ministry of Fabric is a lovely online store and I bought a bunch of fabric on sale - this is the first thing I have made. It is, of course, Les Fleurs fabric by Rifle Paper Co. for Cotton and Steel. This colourway is called 'Rosa Periwinkle' which is quite apt for our property, since much of the fence line is covered in periwinkle...a pretty weed. I paired the periwinkle fabric with some light indigo brushed cotton and powder blue piping...even Emily's badge matches her dress! This was a coincidence! My favourite part about making a Miss Polly dress is constructing the big apron pocket and yoke. I haven't grown tired of it yet! Emily loves storing all sorts of things in her big pockets! I found these cute knee high ribbed socks on ebay and bough a few pairs in different colours. I wish I looked this good in knee highs! Emily still fits into a size four, which is economical on fabric - this dress was made with less than a metre of fabric. There's enough left over for some dolls dresses or collars, etc. Emily is so much fun to have around! She makes everyone laugh and she loves to sing and dance! Happy Birthday Emily! Now you are five! Happy Birthday Emily :) Your new dress is stunning, what a beautiful creative mummy you have :) The fabric looks divine! Awesome! Look forward to seeing it! Happy birthday Emily!! <3 <3 <3 for the fabric and the dress!